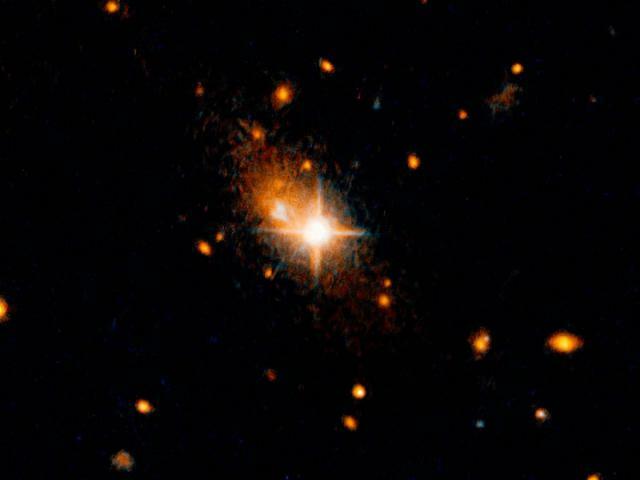 The Hubble Space Telescope detected a supermassive black hole that was ejected from the center of the galaxy 3C186. Scientists suggest that the event occurred as a result of the influence of gravitational waves. This is the first time that astronomers have found a supermassive black hole at a great distance from the center of the galaxy. Although earlier scientists assumed the existence of “escaped” black holes, up to the present time it has not been possible to confirm this. The black hole detected by the Hubble Space Telescope has a mass of one billion solar masses. Scientists estimate that in order to “push out” such a black hole, energy is needed, equivalent to a simultaneous explosion of 100 million supernovae. Galaxy 3C186 is located at a distance of 8 billion light years from us. The existence of a black hole in it can be judged from a bright quasar, located far from the center of the galaxy. Scientists have calculated that the black hole has already shifted from the center of the galaxy for 35 thousand light years, which exceeds the distance between the Sun and the center of the Milky Way. It continues to move at a speed of 7.5 million kilometers per hour. According to scientists, this behavior of a black hole can be explained by gravitational waves associated with the fusion of two supermassive black holes as a result of a collision between 1 billion and 2 billion years ago of two galaxies. Previous story Are you ready for the apocalypse?